Dancing a graceful two-step, the partners in this couple move in harmony together, mirroring each other’s every move. Diplomatic and fair, they easily strike a balance that allows them to both get their needs met. Their only challenge is that their shared desire to keep things light and airy can prevent their union from growing rich with the depth that conflict and struggle can bring. Venus in Libra is a true romantic who thrives on the experience of being in a relationship. In love with love, this Venus looks for every opportunity to show how much she cherishes and cares for her partner. Since she can be conflict-adverse, it can be hard to know when she is upset or angry, which may lead to passive-aggressiveness. When Venus in Libra learns to face problems head-on, she achieves a new level of maturity and growth in relationships. Mars in Libra loves to make everyone feel loved, and with his natural charm and grace, he is good at it. 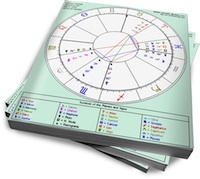 Charming and easy to be around, Mars in Libra is usually popular and sought out. His desire to keep the peace and make things fair for everyone can sometimes find him twisting himself into pretzels to please others. He pursues with a delicate touch, gracefully wooing his lover with romantic gestures that can almost seem indirect in their gentleness. This Mars sometimes has a hard time making up his mind in love, which can lead him to delay the progress of a relationship as he tries to decide which road to take. Venus in Libra is impressed with Mars in Libra’s delicate touch in love and feels him to be a natural companion. Mars in Libra finds Venus in Libra to be the epitome of his desires. Like two peas in a pod, this couple forms a life together that while offering few surprises is filled with satisfaction. Nice blog!! I really appreciate you. This aritle is very helpful. What a perfect pair. True enough that Venus and Mars are a match made in heaven, but both have to be Libras is perfection at it’s finest. Nice article.